"This is a simple recipe for Texas chili I learned from my mother. I like my chili with a little fire to it, but you can adjust this recipe to your liking. This is a chili that only gets better the second day so don't worry about using a large pot and having more than your family can eat the first night because you can have it a couple of nights later. ENJOY. I know I do every time I make this chili." Cook and stir the beef, onion, and bell pepper in a large pot over medium heat until the beef is brown and onion and pepper are tender, about 10 minutes. Drain grease from beef. Stir in beans, tomatoes, tomato sauce, jalapenos (if using), chili powder, red pepper flakes, black pepper, salt, and garlic powder. Bring mixture to a slow boil; cover and reduce heat. Simmer chili at least 30 minutes, stirring occasionally so that it does not stick. This chili can be simmered for several hours; the longer you simmer, the more flavor you will get. 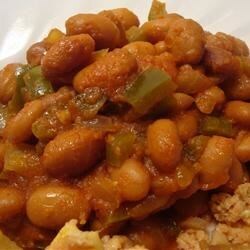 For the 3 cans pinto beans, you can substitute 6 cups homemade cooked pinto beans with juice. I'm going to try this in the slow-cooker--has anyone done this yet, and how did it turn out? this ain't texas chili! we do not use beans! it may have been made in texas, by a yankee! I added fresh garlic cloves, and a beer. Simmered for about 4-5 hrs. Best chili i've ever made.